A notification would be sent to the address below. The TPS7B4250-Q1 device is a monolithic, integrated low-dropout voltage tracker. The device is available in a SOT-23 package. 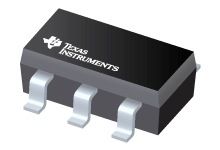 The TPS7B4250-Q1 device is designed to supply off-board sensors in an automotive environment. The IC has integrated protection for overload, over temperature, reverse polarity, and output short-circuit to the battery and ground. A reference voltage applied at the adjust-input pin, ADJ, regulates supply voltages up to VIN = 45 V with high accuracy and loads up to 50 mA. By setting the adjust/enable input pin, ADJ/EN, to low, the TPS7B4250-Q1 device switches to standby mode which reduces the quiescent current to the minimum value. For all available packages, see the orderable addendum at the end of the data sheet.